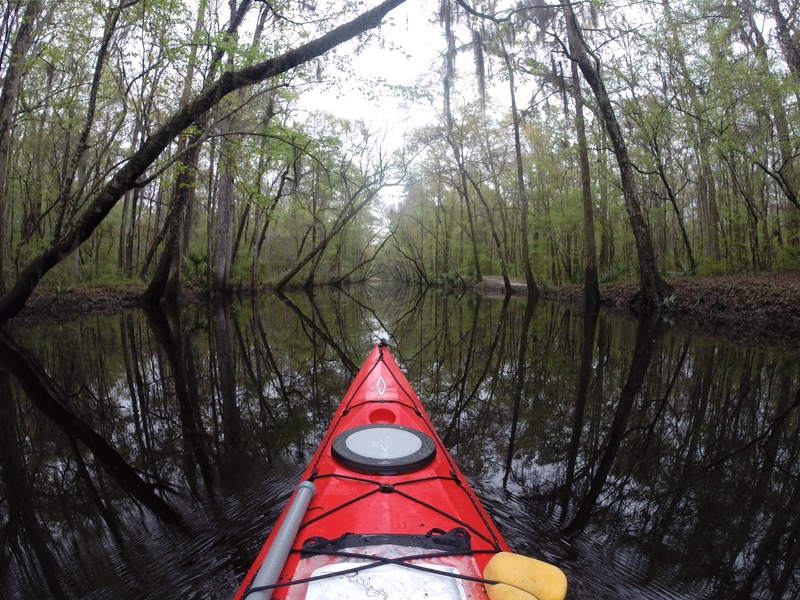 I love paddling in the Ogeechee basin. Ours is a truly remarkable river that teems with life and drastically changes from season to season. I have the good fortune of being responsible for planning and guiding all of ORKs monthly trips, and in my role, I’ve picked up a whole bunch of information and tools that I utilize when organizing our excursions. 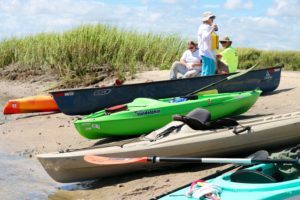 If you happen to miss out on one of our trips or you want to organize your own, my hope is that you will benefit from these tools and tips while planning your own Ogeechee adventure. I’ll refrain from doing a fully-fledged boat review, but I do want to mention a couple things about your vessel if you’re in the market. Canoes work very well on this river, although you may have a tougher time getting past some logs that are close to the surface of the water. Also, I don’t recommend taking canoes into coastal waters, as they are very difficult to get back into if you flip over and can’t scramble up onto a bank. If you’re looking for a kayak that works anywhere in the basin, I’d recommend a boat somewhere between 10 and 16 feet in length – anything longer and you’ll be frustrated in tight turns upstream; anything shorter and you’ll be miserable bobbing in open water closer to the coast. If you are on a tight budget, I’ve found that your money will travel further if you get a used boat on Craigslist from a reputable company rather than a cheap new boat from a big retail store. 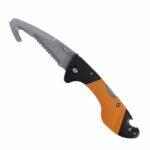 Other than a seaworthy vessel, here’s a list of other things you should consider bringing, starting out with essentials then moving into some more specialized pieces of gear. The key to a smooth paddle trip is planning. Beyond looking at the weather forecast (I’m not going to review weather sites or apps – use whichever one you believe is the least wrong), you should have a very good idea of where you are going and how many miles you plan to log. There are several guide books that can help you plan your route (and make copies for paper maps to throw into a map bag). Both Google Earth and Google Maps (you can make your own map under “Your Places”) are excellent free resources for planning a route and measuring the distance. 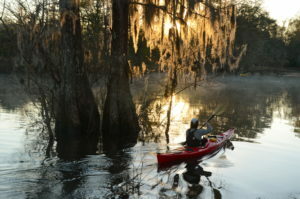 There are many places on the Ogeechee that are difficult to paddle at certain times of year due to low water levels (particularly on the Canoochee and Upper Ogeechee). The USGS site is an excellent way to check on water levels, although it’s important to know that those figures are relative and don’t exactly correlate to how much water is in the river. For instance, 3 feet of water at the Rocky Ford gauge sounds like a lot, but that’s about the minimum you’d want to look for to have a relatively portage-free day of paddling. Long story short, you’ll need to do some trial and error to get to know your local waterway and how it relates to gauge data. In some cases, you can use NOAAs predictive models to let you know what the water level will look like in the near future. If you are paddling near the coast, you must pay attention to the tide. If you read this and then think to yourself, “Yeah, but I’ll be fine,” you’re wrong. You are about to become one of those harrowing tales of Coast Guard rescue or a tragic tale of a lost boater. Don’t cut corners when you plan. There are a bunch of great sites for looking at the tide but Tides4Fishing is by far my favorite. It provides a ton of information in very aesthetically pleasing graphics that are very easy to understand. Also, if you like fishing, it provides a good deal of info on the fishing forecast. With good planning, all that’s left is keeping track of where you are and enjoying your beautiful surroundings, which leads me to. This app could almost replace this entire blog post. Almost. 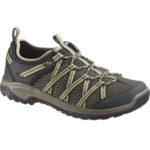 When Paddle Ready first arrived, it was a moderately useful bunch of information and tips. Over the past year or so, they’ve added a ton of features like gear checklists depending on the trip you’re planning, automated float plans with custom alerts if you don’t check in on time, river levels, tide charts, and a map of nearby access points. That is a whole bunch of great features … if they worked reliably. 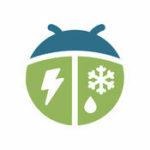 This app has a bunch of potential but is riddled with bugs. I can’t get river levels or tide charts to pull up at all and there are several reviews that seem to confirm that I’m not the only one. Until the kinks are worked out, I’m not sure I would rely too heavily on this app, but it’s still useful for its checklists and tips. This is an incredibly simple app that just pulls gauge data to your phone. Want to know what the river level is on the fly? This app is the easiest way to find out. I mean it. It’s really easy to use. You can set up favorites so you do not have to search for your river every time. Also, this app has a feature where you can set up custom alerts to notify you when conditions are nice or if the river is approaching flood stage – whatever you want. The alerts have been a little glitchy for me in the past but not enough for me to ditch this useful app. One caveat, this app pulls from those same USGS gauges mentioned before and will require a bit of a learning curve as you figure out what the gauge height means for actual river conditions, especially when the river is low. 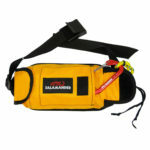 Worst-case scenario is you’ll plan a paddle trip and go on a long walk instead … with your boat … loaded with gear. Yes, it’s irritating but probably not life-threatening. I have this one on my phone in case I’m in a pinch but I NEVER use it. 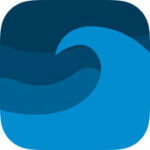 Very similar to RiverApp, Tides Near Me is an incredibly simple app that lists tide charts, you guessed it, near you. Honestly, I think they went a little too simple on this app as it lacks a ton of useful information like moon phase and tidal coefficients. There are no easy-to-understand graphs so if you’re not hip with tidal current lingo, you’ll have to Bing it. I kind of like that this app includes more points on the map than Tides4Fishing (mentioned above), but T4F is so much easier to interpret that I always use that site instead for my trip planning. Do you have a free or cheap tide app that you love? Please let me know! I’ll add it here and give you a shout. 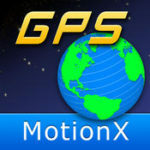 MotionX GPS – iOS only ($1.99); OruxMaps seems to be a good Android alternative (plus it’s free!) although I’ve never used it. I typically use a dedicated handheld GPS for ORK paddle trips to save my phone’s battery more than anything else, but this is a remarkably full-featured GPS app and I’ve used it a bunch. You can do just about anything you could do with a handheld GPS and since it utilizes your phone’s GPS, you don’t necessarily need cell service for it to work (although search functions and online maps won’t work – you’d need to download your map ahead of time). 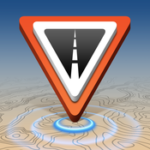 GPS on your phone is a power hog so I recommend using this app to find where you are, then putting your phone in airplane mode to save power. Alternatively, you could bring a secondary power source for your phone (like a power bank), but be wary of capsizing while all these gadgets are out. Even if you get a waterproof case for your phone or a waterproof power bank, they are usually only waterproof if they’re NOT plugged in to anything. I said I wasn’t going to review a weather forecast site or app and I stand by that. I don’t particularly like the Weather Bug app any better than any other app that says “Possible afternoon thunderstorms” all summer long, BUT I love Spark. Spark is a lightning detection function within this app that shows you, in real time, where lightning is striking. It’s very useful in seeing where the worst part of a storm is actually moving and in knowing when it’s time to get out of the water and crouch down next to some shrubs (not in the open and not next to tall trees either – but I’m sure you already knew that). This is a good one to have on your phone when those sudden storms take you off guard. This is not a paddling app. Road ID was developed by the people that make medical identification bracelets for cyclists and runners. [A side note: I think it’s unbelievable that there is a company dedicated to identifying cyclists that have been hit by cars. One of ORKs board members was actually hit while cycling recently, and luckily, he’s slated to make a full recovery. Give cyclists 3 feet! End of side note.] I’ve repurposed this app for paddling as a method for sharing a real-time float plan. You just set how long you plan on being out and identify your contact person/people. Once you begin, your contact person receives a text message with a link to a map that shows where you are in real-time. If you don’t select “Stop eCrumbs” before your indicated time, your contact person will receive a text alert. They could then try to call you or notify the appropriate authorities. DON’T paddle alone. 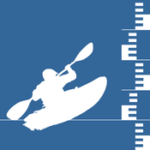 DO share your paddle trip plans with someone who is not on the water whether or not you decide to use this handy app. Let’s end on one of my favorite paddling apps. The Cornell Lab of Ornithology developed Merlin Bird ID. It utilizes your location and a brief set of bird descriptions (size, color, behavior) to then give you a list of what you might be looking at. Each option on that list has several pictures, birdcalls and distribution maps to help you identify the avian friend you’ve spotted. 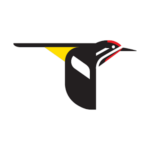 It’s incredibly easy to use and a must have for anyone who is even moderately interested in birding. I would be remiss if I didn’t talk a little about paddling safety. 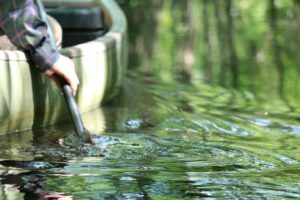 As you explore the wonders of our aquatic environment, you will undoubtedly run into a number of hazards that I won’t even attempt to outline – everything from motorboat traffic to strainers to wasp nests to children swinging canoe paddles in tight quarters. You will never be fully prepared for every possible threat, but you will come out just fine if you slow down, take a breath, and calmly deal with the situation. I can’t tell you how many times I’ve had paddlers flip their boats at the mere site of a non-venomous snake. Stay calm and breathe. Also, wear your PFD. PFDs are like a bicycle helmet (cue eye roll from everyone who has ever paddled with me). It does you no good hanging on your handlebars when you get into a wreck. Your PFD does you no good stuffed under your seat or in a storage compartment if you are taken off guard by a sudden hazard. Moving on. While I don’t want to dig into every potential hazard, I do want to mention a couple. 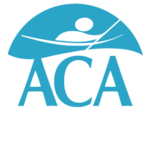 Paddling in cold water or in flood conditions is no joke and should not be attempted by novices. It’s also not a good idea to paddle alone. Most importantly, when you are planning a trip, lose your ego for a minute and accurately assess your abilities and the abilities of those joining you. If, during your planning, the hairs on your neck ever stand up or you feel butterflies in your stomach, do yourself a favor. Cancel your trip. Gather more information. Get the experience you need. Then try again. It’ll be worth it, I promise. 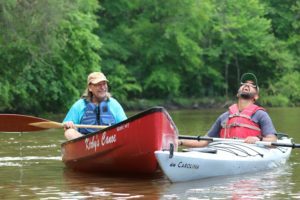 I hope you’ve enjoyed my wandering thoughts on paddling and that you feel better-equipped to get out there with a group of friends. 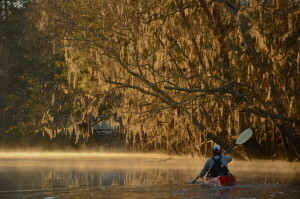 Feel free to share your own Ogeechee adventures with us on Instagram or Facebook. Did I miss something? I want to hear from you. 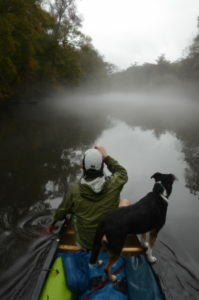 Tell me about your tips, tools and gear for paddling and I’ll happily update this list.